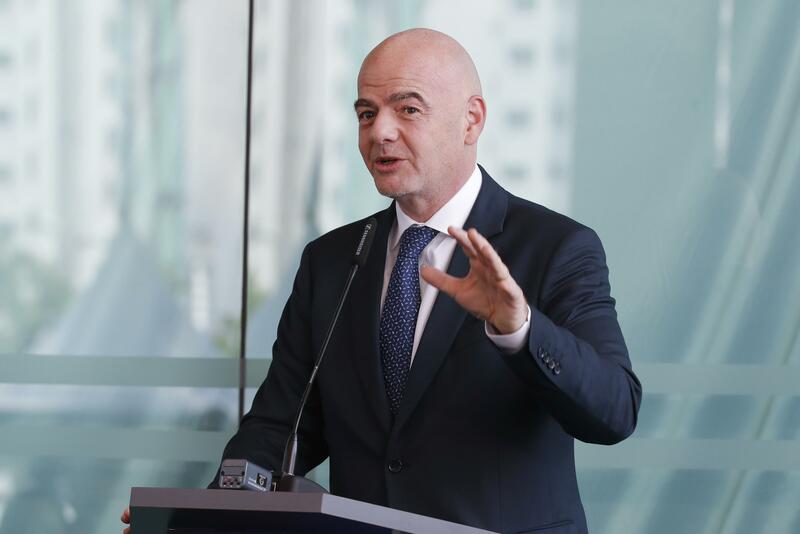 ZURICH – Soccer’s biggest names would be banned from the World Cup if they played in a breakaway European Super League, FIFA President Gianni Infantino said Wednesday. Infantino, speaking to a small group of reporters at FIFA headquarters, said the governing body would punish players at clubs like Barcelona, Manchester City and Bayern Munich if they left soccer’s organized structure to form a privately-owned league. Talk of a long-threatened super league was revived Friday when German magazine Der Spiegel published confidential documents and emails from clubs and soccer bodies in its “Football Leaks” series. The plan called for 11 storied clubs from Spain, England, Germany, Italy and France to get ownership stakes and risk-free Super League membership for 20 years, with five more clubs invited to play. The breakaway from soccer’s historic hierarchy – FIFA, the six continental bodies and 211 national federations – would allow FIFA to ban players from the 2022 World Cup in Qatar. Both Infantino and Bell were long-time staffers at UEFA, which has steadily changed Champions League prize money and entry rules to favor top clubs and stall breakaway threats. “This is the history of the last 20 years,” said Infantino, who has clashed this year with European soccer officials and club leaders over FIFA’s proposed Club World Cup project, which is funded by Japanese investor SoftBank. Infantino said his plan – potentially featuring 12 European clubs in a 24-team lineup, and worth a promised $3 billion every four years – could head off a private closed league. “If the price to pay is to give proper revenues to a club participating in a Club World Cup but this allows us to … give $1 million to Haiti who has nothing, or to Mongolia who has three time zones but only two football pitches, well then we should be I think doing that,” he said. A FIFA task force will assess a revamp of competitions, including a new event for all national teams played every two years. A decision is expected in March when Infantino chairs a FIFA Council meeting in Miami. He also believes the latest threat will calm. Also Wednesday, Infantino addressed the “Football Leaks” documents that showed him being pressured by wealthy clubs during his time as UEFA’s top administrator to ensure they avoided a Champions League ban for breaking “Financial Fair Play” rules designed to curb overspending. Some critics suggested Infantino overreached his duty when independent panels were investigating and judging clubs such as Manchester City and Paris Saint-Germain. “We were doing our job and saved the system, and we saved European club football,” Infantino said. In further “Football Leaks” fallout, Infantino said it was unfair that a childhood friend, Rinaldo Arnold, was under scrutiny. A special counsel is assessing if Arnold’s work as a regional prosecutor in Switzerland is in conflict with private invitations to games from Infantino and their professional contacts. “I think there are much more serious issues that can be looked at,” the FIFA president said. Published: Nov. 7, 2018, 8:03 a.m. Updated: Nov. 7, 2018, 10:31 a.m.